A simple post today about a particular kind of Great War artifact: the sweetheart brooch. Above is a lovely example of a sweetheart brooch, a commonly exchanged jewelry item during both twentieth century world wars. The brooch tradition, some say, began with the Boer War, though soldiers and loved ones have exchanged various small tokens of remembrance for ages. There are, furthermore, non-military sweetheart brooches, which were popular especially in the Victorian era. Sweetheart brooches are one aspect of the amazing array of insignia that civilians donned during the Great War. For example, I wrote some time ago about my own Needlework Guild Badge, a small symbolic brooch for textile volunteers. As wartime tokens of remembrance, sweetheart brooches symbolized relationships, pride, and served as a visual symbol of the constant stream of thoughts flowing between service-people and civilians. 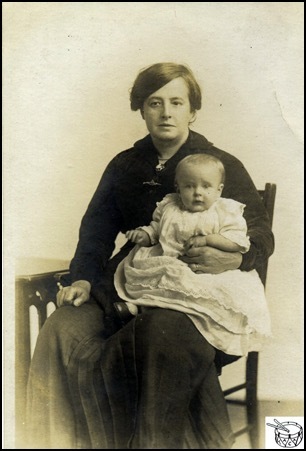 The below photograph, from the wonderful British Army Children's Archive, shows a mother and her baby. The woman, whose tightly clenched right fist (resting on her knee) and somewhat weary look seem to evidence fatigue, grief, and determination, wears a sweetheart brooch at the top center of her blouse. WWI-era Royal Navy Sweetheart Brooch with mother-of-pearl backing. © Field Service Antique Arms and Militaria. Silver sweetheart brooch of the Liverpool Pals, n.d. © IWM, Item INS 6139. I hope you've enjoyed this little excursion through one of my own favorite aspects of WWI material history. This post concludes November's month of remembrance-themed writings. Next month I'll be looking at holidays and festivities on the front and at home. Thanks for reading and stay tuned! "Horlick's Ration of Malted Milk Tablets," ca. 1914-18. © Brown University. Today I write in a lighter vein amid our recent attention to remembrance and commemoration. The primary theme of the month will continue, rest assured. I just couldn't help but write about a cheerier aspect of First World War history to which I recently connected. Horlick's was something of which I'd heard in various places but had never encountered in person. Most recently, while watching PBS's excellent series, Call the Midwife, I noticed that characters in the television drama, which is set in the post-World War Two era, mentioned drinking Horlick's left and right. The show's tired, frazzled, nurses and nuns turn to the drink when agitated or exhausted. Perhaps--almost certainly?--this was deliberate product placement. However, the drink's comforting qualities (which are still celebrated today) were so frequently touted that I grew curious. There goes a Horlick's tanker truck, 1932. © Getty Images. Here in America, I feel as though the range of popular non-alcoholic beverages is concentrated mostly in the carbonated category. We like our sodas (though I'm not a huge fan). Tea has some loyal drinkers, especially in my family, and coffee and its spawn of various nominally-related improvisations (usually blended and topped with assorted whipped cream, sprinkles, and syrups) are also beloved. Given this liquid landscape, beverages less well-known in the U.S., such as Bovril, Oxo, or Horlick's, for example, take on rather exotic and mysterious aspects. You may wonder why I'm writing about Horlick's here at Ghosts of 1914. Well, as I discovered through various excursions online, Horlick's had an important role during the Great War. Now an internationally-sold product, Horlick's had its origins in Atlantic crossings. It all began in the 1860s, when British brothers William and James Horlick moved to the United States and established a factory producing a malted milk beverage in Chicago, Illinois. After moving the company to Wisconsin and patenting their beverage powder mix, the brothers stretched the company's reach back across the pond. A London office and a manufacturing plant in Slough were established by 1910. Horlick's became important for British soldiers on the front in World War One. 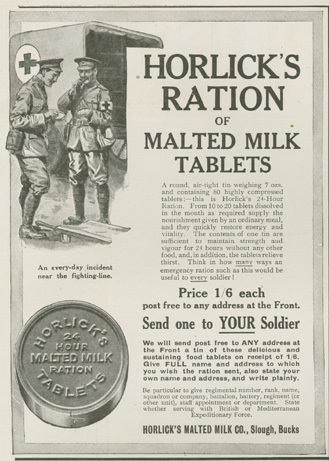 As with tea-making provisions that I covered in an earlier post, Horlick's was a dried product and, formed into tablets, it could be included easily in a soldier's pack. Horlick's was known to have nutritive and calming powers. In the above poster from Brown University's collection, ambulance drivers pause to snack on the tablets directly, without even mixing them in water. The "delicious and sustaining" tablets provided important nutrients, making their consumption, as the poster's verbiage claims, "an every-day incident on the front." Though there isn't a related image, the IWM has a letter in its collection related to the procurement of Horlick's tablets for a British prisoner-of-war in Germany, in 1915. Indian troops in the British Army became accustomed to consuming Horlick's while serving in the First World War, according to Wikipedia. This "every-day incident" led to the brand's foothold in India after armistice. By the 1920s, as historian Douglas E. Haines writes, Horlick's was advertised in India as a health product for all. The company's later promotional campaign, Haines's fascinating analysis shows, revolved around colonial-era stereotypes and depended heavily on association with masculine strength. The long and complex history of Horlick's, which persists quite powerfully and internationally today, is vaster than I can convey here. For further exploration, the company's website has some interesting resources. The LA Times also featured an informative article on the history of Horlick's some time ago. In light of its history and near-magical claims of mood-altering properties and gastronomic enchantment, I decided recently that I simply had to try Horlick's (the UK version, which I managed to find in my local grocer's international aisle). I am sitting here drinking my very first "cuppa" as I type. Horlick's, in my beloved and historically-appropriate "Votes for Women" mug. Anyway, it's been fun sharing a cuppa Horlick's famous beverage with you. Thanks for joining me on this little culinary detour. Next time we will return to the theme of remembrance for November. Happy Thanksgiving to all of my readers celebrating the holiday, and stay tuned for our next visit to the Ghosts of 1914. On November 11, 1920, the Whitehall Cenotaph war monument was unveiled in London. The memorial, by definition an empty tomb, honored the staggering numbers of British war dead, nearly all of whom were buried abroad. Crowds gathered to see Edwin Luytens's impressive structure as part of the day's solemn events. As I have written earlier, attendees would later proceed to Westminster Abbey for the Unknown Warrior's funeral service. Horace Nicholls. The Cenotaph about to be unveiled, 11 Nov. 1920. © IWM, Item Q 31489. Edwin Luytens. Model for Whitehall Cenotaph, 1919. © IWM, Item ART 4207. As the IWM's detailed description for the model states, Luyten's commission to honor the Peace Treaty evolved into the Cenotaph's spartan form over the course of discussions with David Lloyd George and other government officials. Lloyd George had asked Luytens to construct a ceremonial catafalque; Luytens modified this plan to create a cenotaph instead. Before the official unveiling in 1920, a temporary monument, designed by Luytens and constructed of wood and plaster, had stood in its place. Below is a photo of the top of the original Cenotaph. Sadly, as historian Gaynor Kavanaugh writes, the original structure, which was held in the Imperial War Museum's collections from the 1920s, was destroyed by a bomb during World War Two. Horace Nicholls. The top of the original Cenotaph, on display at the Crystal Palace, 1920-24. © IWM, Item Q 31521. The Whitehall Cenotaph continues to be one of London's most recognized monuments and a focal point of commemorative services each year. It was also, for a time, as I have written, a focal point for Spiritualists' haunting photography and claims about the return of the ghostly war dead. When I visited London a couple of years ago, I remember seeing faded poppy wreaths and decorations laid at the foot of this striking and somewhat eerie structure. Many cities across the world have constructed their own cenotaphs to honor the dead of various wars. You can often find such memorials on town greens or at street crossings in communities large and small. Horace Nicholls. Whitehall Cenotaph, 11 November 1920. © IWM, Item Q 31497. For more on the Whitehall Cenotaph, consult the IWM's incredibly vast resources on the monument and its history. See also Neil Hanson's book, Unknown Soldiers and Allyson Booth's wonderful critical work, Postcard from the Trenches. BBC News has a video history of the Cenotaph. See also Derek Boorman's book, At the Going Down of the Sun. Happy Veterans Day to you and "thank you" to all readers who serve, have served, or have family members in the military. In honor of Veterans Day, here are some service ideas for you to consider. The following organizations seek donations of funds and/or needed items and volunteers. This organization (highly rated by charitywatch.org) offers military families temporary "comfort housing" where they can stay locally when loved one is being treated for injuries or illness. This organization advocates for healthcare, employment, and other important social services and support for veterans and their families. These are just a few ideas to get you started thinking about service options in your local, national, or worldwide community as you remember veterans and current military service-people. William Edginton Memorial Plaque. © IWM, Item EPH 2114. During the war, the British Government began working to develop a personalized token of remembrance to distribute to the families of fallen soldiers. Edward Carter Preston was declared the winner of a design contest held in late 1917. A paper scroll bearing an inscription penned by M.R. James, Provost of King's College, Cambridge (and an amazing writer of ghost stories) with edits proposed by King George V and the novelist Charles Keary, was also to be issued with each plaque. Memorial Scroll for Herbert Walter Stacy, 1919. © IWM, Item EPH 2223. The plaques were produced beginning in late 1918 in Acton and later at the Woolwich Arsenal. Scrolls were woodblock-printed at the London County Council Central School of Arts and Crafts, starting in January 1919. Each plaque bore Preston's elaborate design and each scroll the commemorative inscription; both pieces featured the individual service person's name. It was decided that all soldiers and female service-people who died of war-related causes from August 1914 through April 1919 would be commemorated with a plaque and scroll. These materials were sent to relatives of the fallen through the 1920s. The "Great War 1914-1918"website states that over a million plaques and scrolls were created and distributed. Many are still kept by families while others are now in museum collections or in commercial circulation. The "Great War 1914-1918" website has a helpful introduction to the history of the memorial plaque, as well as many interesting illustrations. The IWM's collection also has many plaques and related objects to explore. Mounted memorial plaque and photograph for E.M. Tyler, ca. 1918. © IWM, Item EPH 499. While working at the Yale Center for British Art a couple of years ago, I had the honor of handling and researching the history of two sets of these remarkable mementos. They had come to the museum as part of larger family archives of items related to two soldiers. I can only say that the experience of working with these carefully preserved pieces along with their packaging and related medals, photographs, and letters was a moving experience. While nothing could bring back the dead, the plaques meant something to many families who received them and they were preserved, copied through graphite rubbings sent to friends, and displayed in loving fashion. I don't know that the plaques or scrolls could express much of the personal stories or losses that they attempted to memorialize. However, they bring home a sense--maybe only an inkling, but it's impressive enough--of the individual people who were lost in this crisis. They make the vast numbers or statistics that were part of the war's recording palpable and overwhelming at the same time. Both commemorative of a past tragedy and cautionary about the human price of combat, they help us to remember. On November 11, 1920, the Great War was commemorated in a major way in London. Two monuments were unveiled. These were the Whitehall Cenotaph and the Tomb of the Unknown Warrior in Westminster Abbey. The Tomb of the Unknown Warrior © Westminster Abbey. The two memorials evolved together as part of a major project to recognize the toll of the Great War and to attempt to channel public grief into some kind of symbolic object. Such projects are often fraught with difficulty and the nature of the symbols chosen and constructed are debated intensely. The idea for Britain's Unknown Warrior (who was originally known as the Unknown Comrade, according to historian Neil Hanson's excellent book, The Unknown Soldier: The Story of the Missing of the Great War) was developed by Chaplain David Railton. Chaplain Railton first thought of the memorial when he saw the grave of an unidentified British soldier while serving in France. The grand and historic Westminster Abbey had a tradition of royalty and noted Britons being buried or memorialized onsite. Railton's "Unknown Comrade" would rest in the company of kings, queens, authors, and musicians. Westminster Abbey's website has a detailed and very informative page on the history of the Unknown Warrior. So does the Western Front Association, whose page features several fascinating photographs. BBC News also has a useful page on the Unknown Warrior, and a fantastic, moving, slideshow of images. The Warrior's story is also recorded in the Oxford Dictionary of Biography. The soldier who would become the Unknown Warrior was chosen from among bodies exhumed from four different battlefields on the Western Front. Brigadier General L.J. Wyatt chose one set of remains at random in a small military chapel at St. Pol in France, near Arras. The Western Front Association's page on the Unknown Warrior considers some alternate versions of the selection process. The Unknown Warrior's body was sealed in an English-made coffin and brought to Dover aboard the H.M.S. Verdun on November 10th. Later that day, the coffin was brought by train to London's Victoria Station. On the 11th of November, Londoners gathered for the unveiling of the Whitehall Cenotaph, which was followed by the Unknown Warrior's majestic funeral service at Westminster Abbey. S. Burgess. Napkin commemorating Cenotaph and Unknown Warrior, 1920. © IWM, Item EPH 1754. In the days following the service, over a million people paid their respects to the Unknown Warrior. The following year, an inscribed slab of black marble was laid over the tomb and it remains there today. Upon the Duke of York's marriage to Lady Elizabeth Bowes-Lyon at Westminster Abbey in 1923, the young bride placed her bouquet on the Warrior's grave. Elizabeth had lost a brother in the war and her personal gesture touched citizens across the nation. The tradition of royal brides' bouquets laid on the grave as a mark of respect continues to this day. Though he was said to be known only by God, the Unknown Warrior offered many civilians the closest approximation to the hundreds of thousands of individual Britons known, loved, and lost in the war. The Intrepid Fallen Heroes Fund serves United States military personnel wounded or injured in service to our nation, and their families. Supporting these heroes helps repay the debt all Americans owe them for the sacrifices they have made in service to our nation. They are, in the words of our founder, the late Zachary Fisher, “our nation’s greatest national resource,” and they deserve all the help that our nation can provide. The Intrepid Fallen Heroes Fund is a leader in meeting this important national mission. This charity serves American and British military personnel, focusing on severely injured veterans. They offer aid and medical rehabilitation to many servicepeople, including those with traumatic brain injuries. The IFHF is highly rated by www.charitywatch.org , the American Institute of Philanthropy's watchdog website (and a valuable resource in and of itself). Today's featured charity is just one option for remembering our veterans. I am not affiliated with this organization and merely offer it for your consideration and for you to find out about some of the innovative treatments and help being offered to today's injured servicemembers. In future posts, I'll be mentioning volunteer opportunities and other charities connected to veterans, primarily in the U.S. Please feel free to contribute suggestions in comments! I'll also be back to write more about commemoration in the post-Great War era throughout the month. Just a quick post to note a milestone for Ghosts of 1914: 10,000 views!! Here's to another 10,000 and another! Thank you for reading! November, the month of Armistice and Veterans' Days, is an apt time to reflect on war and peace and to be grateful for those who have served. It is a time to think of military personnel who have been lost in past and present conflicts and to consider helping their comrades who have returned home. Remembrance is not just about nostalgia and it does not necessarily involve an extended backward glance into history. We can remember right where we are, in our own communities, and we can make remembrance an act of service. With these thoughts in mind, posts this month will focus on the theme of commemoration as it relates to the Great War, something that figured prominently in my (recently-completed) dissertation. I will also be posting information about remembrance-related service opportunities and resources for readers to consider. I am not professionally affiliated with any organization, so my suggestions will just be ideas that I've come across and want to pass along. Feel free to contribute your own in comments. Thank you for reading and stay tuned for more about remembrance and the Ghosts of 1914.